LeBow recently announced a new enhancement to the MBA program. The Lawrie Advanced Global Leadership scholarship, created and funded by alumnus and member of the Board of Trustees Mike Lawrie, is designed to give select MBA students the opportunity to develop their ability to think strategically and work in diverse teams, all while being exposed to the private equity industry. In order to be considered for the scholarship, interested students participated in BUSN T680: The Global Leadership Experience, which was structured as a consulting class in partnership with Hamilton Lane. Hamilton Lane, an alternative investment management firm headquartered in Bala Cynwyd, has been a longtime Drexel partner; the company has employed more than 60 undergraduate co-op students since 2008, and 15 Drexel alumni currently work there. For 10 weeks, students worked to understand the private equity industry and Hamilton Lane’s position in the market and made suggestions around growth, marketing and strategy. Focused on the private markets asset class for the first time this year, the MBA program’s experiential consulting course was designed to offer graduate students the opportunity to work directly with a hypothetical client and a team of client mentors to assess real-world problems and, ultimately, to present innovative potential solutions. 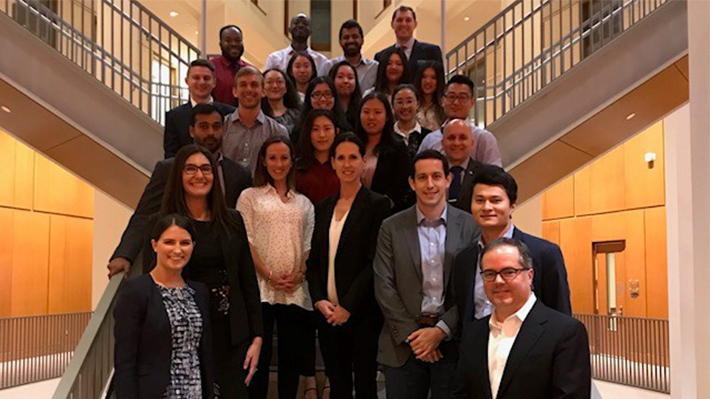 Over the course of the spring term, students acted as consultants, diving deep to understand the firm and industry, with the goal of proposing solutions to business challenges and identifying strategic growth areas. The MBA students worked under the supervision of Assistant Clinical Professor of Management David Kurz, who specializes in organizational behavior and experiential learning. Kurz was instrumental in helping the students navigate through this complex case study, working closely with Hamilton Lane to design the program in its focus on a specialized asset class that was not traditionally studied in the business school setting. Hamilton Lane employees came away impressed by the students’ final presentations and eager to bring them back to the firm, and two students were ultimately chosen by a panel of faculty and staff to receive a scholarship based on their experience in the course, their other academic work and leadership and teamwork skills. In addition to receiving financial support for some of their classes, including a capstone experience in the private equity industry, the recipients will participate in two module sessions led by Mike Lawrie and global c-suite leaders.